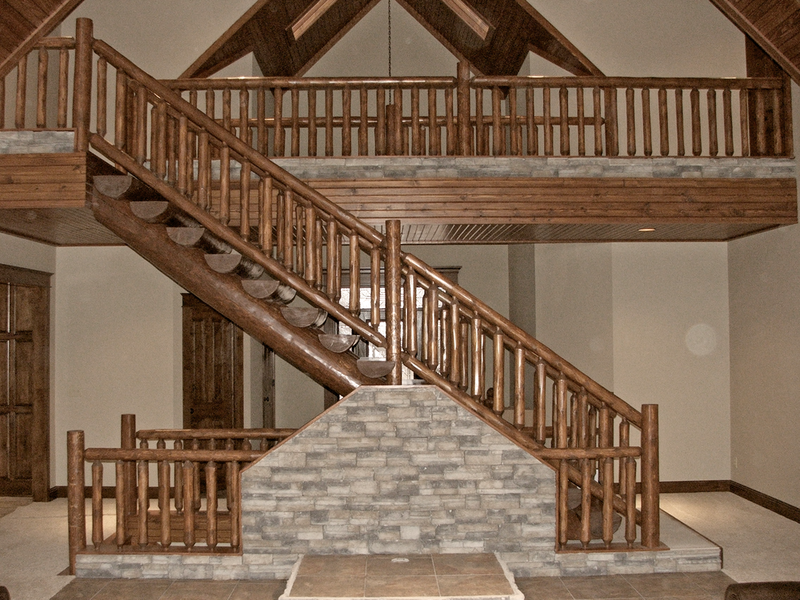 staircase design, the stringers are full 10" to 12" pine logs the treads are coped or scribe unto the stringers. There is also an option for only one single stringer to be supportive. The treads can be either full log ends (as soon above) or half log. Each cope is done by hand to match the unique contour of each and every organic tread. The tread profile is visible from the side view. This style achieves maximum width of a staircase with or without a flare or variance in tread width. The stringers rest lower than in the mortise and tenon style, so often an extension timber may be necessary. The full scribe stairwell gives you several options of varying tread length adding character and appeal. The full scribe staircase is assembled in the shop and disassembled for shipping.